Things just got a little bit more serious with this bad boy… the Nerf Rival Zeus MXV 1200. Best nerf gun ever. The Nerf Rival Zeus MXV 1200 definitely isn’t for the faint of heart. If your family wants to win the next yearly community Nerf/BBQ competition (yes, they do exist) then we highly recommend equipping everyone in the family with one of these bad boys. Keep in mind that they don’t shoot normal NERF darts… this baby shoots high-impact foam rounds, similar to paintball pellets. Not only are they high-impact, they also go extremely far. Over 75 feet as a matter of fact. Comes in red or blue so you can make up teams and the magazine holds 12 rounds of pure awesomeness. Best nerf gun ever! 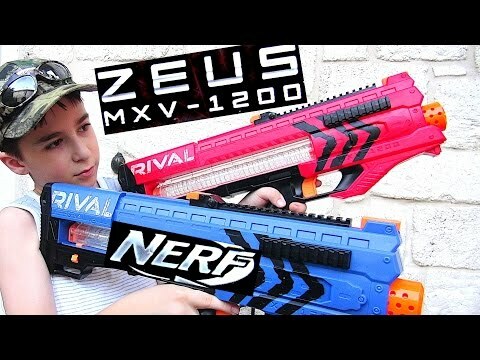 Robert-Andre's Nerf Rival Zeus MXV-1200 Blaster / NERF BATTLE! If you like to MXV 1200, then read our post “So What’s New In Nerf Toys?” where we highlight some of the other new Nerf guns that came out recently. You won’t be disappointed!